Never flat puncture resistant wheels and a light frame make it easy to move around the house to clean surfaces such as driveways, pavers, windows or gutters. Petrol power gives greater portability and freedom from power cords and electrical hazards. Detergent injection system increases cleaning power. Supplied with 4 interchangeable nozzles for varied pressure rates and suitable for a full range of cleaning tasks. 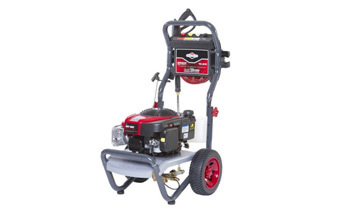 Gain the reassurance of a network of nationwide service providers when you buy this quality pressure washer.